On the evening of Friday, November 30, Hezbollah's war media broadcasted this video addressed to Israel and subtitled in Hebrew, in response to recent Israeli military exercises simulating an aggression against southern Lebanon, an escalation of violations of Lebanese airspace –from which aggressions against Syria are usually carried out– by Israeli drones, and new threats to assassinate Hezbollah Secretary General. The statement in the video is excerpted from the latest speech by Hassan Nasrallah on November 10, 2018, and the footage shows in particular the precise coordinates of Israeli military bases that would be targeted in case of aggression. Let us remind that Hezbollah's policy is to target exclusively the military, and to hit the colonies and cities of the enemy only in response to the ongoing Israeli aggression against Lebanese civilians. The civilian/military ratio of the victims of the 2006 war was 1/10 on the Israeli side, and 10/1 on the Lebanese side, a striking proof of the fact that Israel strikes civilians above all, and that Hezbollah favors military targets. Despite the August 2006 ceasefire, Lebanon and Israel remain in a state of war, and if direct clashes have ceased, information & psychological warfare continue to rage, as are indirect clashes in Syria or even Yemen, where Israeli planes are directly involved in the conflict. At a time when the Gulf countries are openly engaging in the normalization policy of relations with Israel, when yet another futile attempt to strangle Iran economically is at work, and where MBS is touring North Africa to promote Israel's peace agreement with Israel, Hezbollah recalls that its hostility to Israel remains irreducible, demonstrating its solidarity with the Resistance in Gaza that has recently scored a new victory, which foreshadows a real disaster in the event of a confrontation with such a powerful actor as Hezbollah. 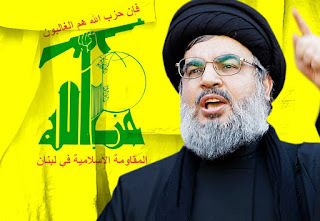 Hassan Nasrallah has several times announced as imminent the Great War to Liberate Palestine, in which the extended Resistance Axis (Iran, Syria, Hezbollah, Iraq and Yemen) would participate. This video made headlines in Israel Friday night and throughout the weekend, and senior military officials of the Zionist entity reacted to it. In accordance with its policy of anti-Nasrallah censorship, Youtube immediately deleted this video broadcast, among others, by Al-Manar (French) and Sputnik (English) for alledgedly “violating Youtube's Terms of Service”, but Israeli media like Ynet were able to broadcast it on the platform without fear of censorship –proof that the content itself has no valid reason to be censored according to the Youtube's Terms of Service. Only sources that are a priori favorable to Hezbollah are tirelessly hunted down by IDF cyber-soldiers and deleted.